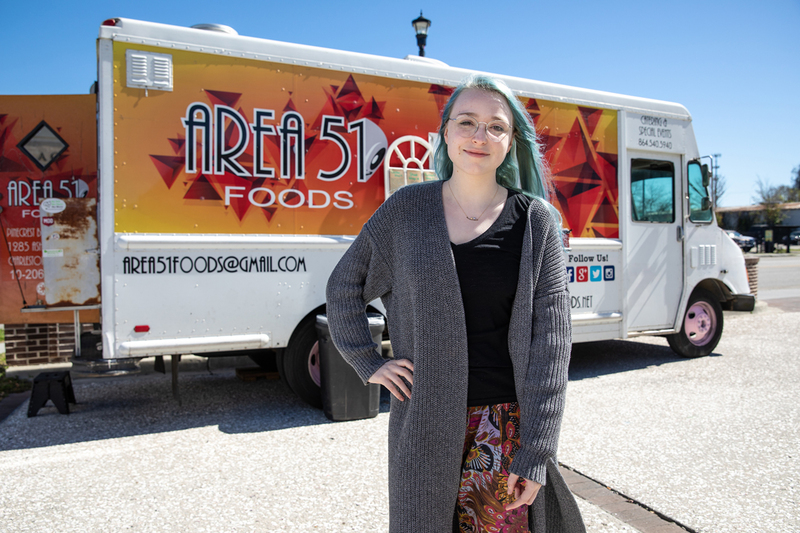 As majority shareholder of the food truck Area 51 Foods, College of Charleston sociology and English double major Carolina Grace Bowen stays busy outside of the classroom managing food preparation, customer services, budgets and scheduling for the business. In 2015, Bowen’s family opened Area 51 Foods, named after the U.S. Air Force base subject to frequent UFO conspiracy theories, as a way to pay for the insulin she needs to manage her Type 1 diabetes. 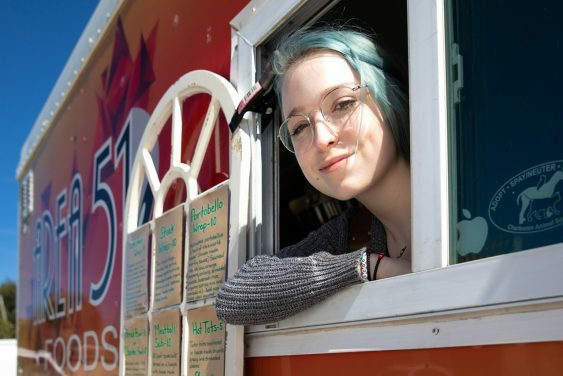 The food truck not only supports members of her immediate family, but Bowen and her family also take pride in the way they treat their employees and community – something that stems from her sociology coursework. As an example, after Hurricane Florence, Bowen drove the Area 51 truck to the Myrtle Beach area to donate food to evacuees and service workers. The business also makes providing food for customers with food allergies and special diets a priority. Bowen also credits her English courses for teaching her how to communicate and network efficiently with customers, co-workers and event coordinators. As a double major, you might wonder how Bowen has the time to run a business. But, it’s her demanding schedule that she attributes to her success. “My busy schedule has really helped me learn to be more organized and manage my time more effectively,” she says. And while she has plans to eventually work in medical sociology, focusing on the ethics side of healthcare in social work or human resources management, Bowen hopes to continue operating the food truck for years to come. You can find Area 51 Foods parked at the MUSC Greenway as well as at local breweries across the tri-county area. Look for the food truck at the Lowcountry Hemp Festival in April. The most up-to-date locations for Area 51 Foods can always be found on the truck’s Facebook page: https://www.facebook.com/Area51Foods/.